Digi-Schlock: DEAD KIDS (Severin Blu-Ray/DVD Combo Pack) – Schlockmania! It was a long road to respectable home video treatment for Dead Kids. It was first issued during the VHS era on a lousy-looking full-frame cassette (under its initial U.S. release title, Strange Behavior) that made mincemeat of its careful Cinemascope compositions. It had to wait a few decades to get a proper widescreen transfer from Elite, one that was reissued a few years later by Synapse. Severin Films picked up the title to bring it into the high-definition era and the results are the best treatment yet for this unusual cult item. Dead Kids received a fresh HD master for this set and it looks impressive, particularly on the blu-ray disc in this set: the image is detailed and boasts rich colors, including some appropriately deep black levels on the night scenes and shadowy interiors. Fans will be interested to know that the version included here incorporates a pair of scenes that were deleted from earlier versions so this is the lengthiest cut to date. The original audio mix is used for the transfer, presented in a DTS lossless format on the blu-ray, and the results sound clear and nicely balanced. Soundtrack fans will be happy to see that there is also a separate audio track devoted entirely to Tangerine Dream’s atmospheric electronic score. In a nice touch, Severin has compiled the pre-existing extras from the Elite version for this set and added some new material of their own. For starters, there are two commentary tracks. The first dates back to the original Elite disc and features screenwriter Bill Condon with stars Dey Young and Dan Shor. Condon acts as the moderator on this track and displays a charming “gee whiz” sensibility as he guides the listener through the why and how behind his first feature credit. 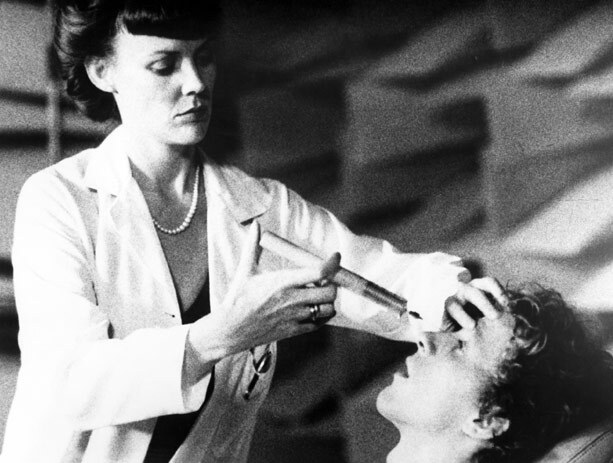 Condon has a sharp memory of the project’s genesis so he offers a lot of nice details on how he met Laughlin, how they ended up shooting in New Zealand, the challenges of getting it distributed domestically and the specific reason the film was retitled Strange Behavior in the U.S. He also throws in a variety of fun trivia, like how Klaus Kinski was originally cast as the film’s mad doctor and that Woody Allen and Buck Henry are fans of the film. Young and Shor also chime in with their own anecdotes: Young tells a fun story about a chance meeting led to her being cast in the film and Shor relates a hilarious anecdote about co-star Scott Brady. In short, it’s a fun track – for both the facts and the warm cameraderie of the participants. The next track is a new one recorded for this set that features director/co-writer Michael Laughlin. The audio quality is a little rough as it was recorded via Skype but fans will find it worth a listen. His track acts as a complement to the first commentary, with him offering his viewpoint on different topics and being able to shed more light on the financing and casting elements of the film. He also has a lot of unique material to offer up about the casting of the film, particularly since he was friends with many of the veteran actors in the cast. However, the most interesting element of the Laughlin commentary is that he several strong opinions on the correct way to make films and shares them with the candor of a veteran who isn’t afraid of stepping on toes. Topics he discusses include the benefits of shooting in anamorphic, shooting long takes to make editing easier and why shorter shooting days make for a better production. Most interestingly, he talks about how all films, regardless of genre, need to have three elements: humor, suspense and a sense of scale. This element of Laughlin’s commentary makes it a great listen for those interested in filmmaking. Also included is a new featurette with makeup FX wiz Craig Reardon, who masterminded the brief but important effects for the film. He reveals how he inherited the gig from his mentor Tom Burman with just a few days to spare and goes into detail on how each FX gag was achieved, often using only rudimentary materials. The detailed discussion of the “hypo in eye” gag is particularly illuminating. Reardon is a good storyteller and even offers a few bonus recollections of his other films at the end of the segment. You’ll walk away from this piece with a new appreciation for Reardon’s simple but effective illusions. The package is rounded out by two theatrical trailers, one for the U.S. market and one aimed at international audiences. 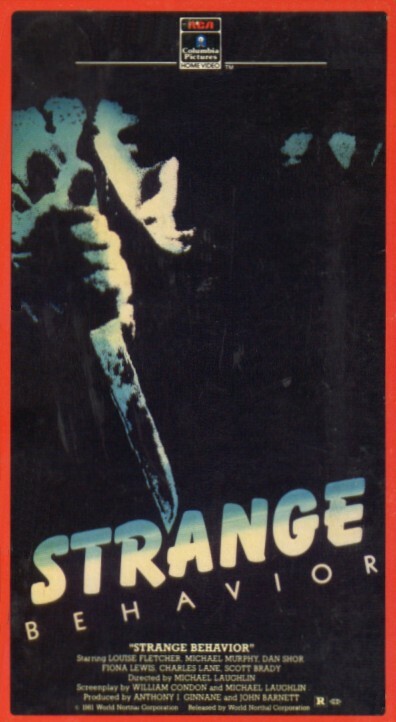 The U.S. trailer (under the title Strange Behavior) does a decent job of selling the film as a potential cult item but the international trailer is the better of the two. It takes a little more time to outline the film’s unique plot and stylistic angles and does a better job of giving the viewer a taste of the film’s off-kilter appeal. Simply put, Severin has raised the profile of Dead Kids to a new plateau with this combo set. The transfer is fantastic, particularly when viewed on blu-ray, and the new extras flesh out the vintage extras they have collected for this set. It’s worth the investment for any fan of quirky ’80s-era horror. 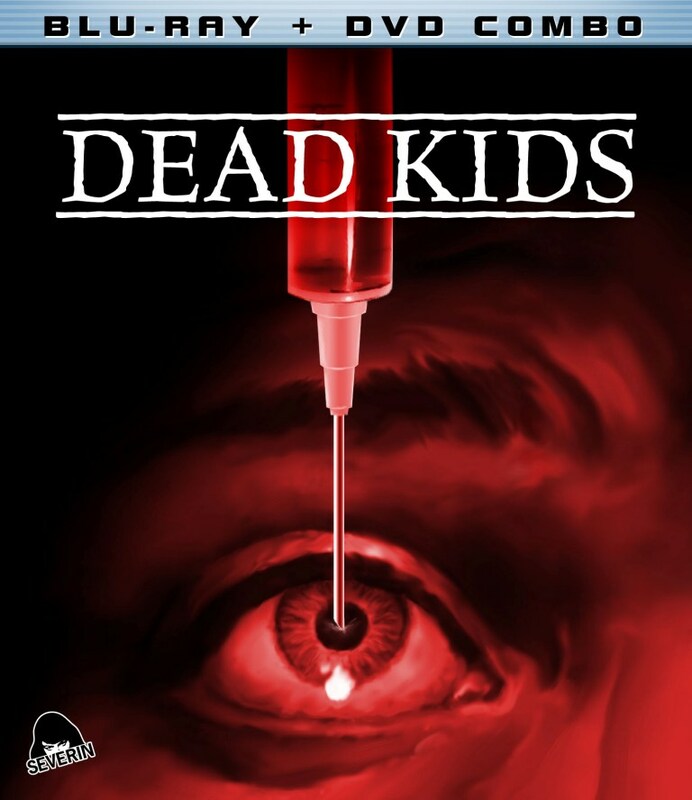 To read Schlockmania’s film review of Dead Kids, click here. Dead Kids Trailer from Severin Films on Vimeo.